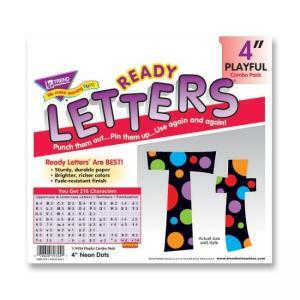 Ready Letters are designed for attention getting messages, classroom displays and creative learning projects. Ideal for pre-kindergarten to 12th grade. Simply punch out and pin up the letter. Each letter has a black background and colorful neon dots. Combo Pack includes 59 uppercase letters, 83 lowercase letters, 20 numerals from 0 to 9, 36 punctuation marks and 18 Spanish accent marks.